Depending on temperature and distance, pre-oxidation is carried out either at the water intake or at the treatment plant site. This treatment step is designed to compensate for the raw water’s lack of oxygen or to remove undesireable gases (such as H2S or CO2). When this stage is carried out in the open air, the water’s increased oxygen content will be in equilibrium with the carbon dioxide removed. In the case waters having average or high mineral content, this aspect must be taken into consideration because any loss of “balancing” CO2 can result in scaling conditions. This may necessitate the use of pressurised aeration which allows for increase in O2 concentration without any corresponding change in the CO2 concentration. As discussed, in the presence of organic matter, pre-chlorination will be accompanied by the formation of unwanted compounds; therefore, as a rule, it is better to place the chlorination point as far down the treatment line as possible, ideally following the maximum possible elimination of organic precursors present in the water. Pre-chlorination can only be maintained when the water does not contain precursors in large quantities; pre-chlorination is used when there is a danger of algae developing in the clarification structures, or for the elimination of NH4+ ions or to oxidise ferrous iron to ferric iron. Pre-chlorination can also be applied at an intermediate stage (e.g. 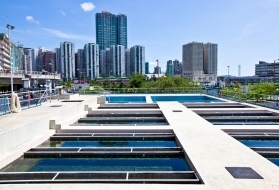 to the clarified water) to prevent biological fouling (bacteria, algae, zooplankton…) on filters. When the raw water does not contain any ammonia, consideration can be given to the use of chloramines that have been previously produced through the reaction of chlorine with ammonia or ammonium sulphate. This technique was developed as an attempt to replace chlorine during pre-oxidation. In effect, chlorine dioxide, although it will not oxidise ammonium, will not result in the formation of THM either. However, when it reacts with NOM, it releases CℓO2– (chlorite) ions that subsequently have to be eliminated. As the result of new standards (decree 2003-461), the use of chlorine dioxide in pre-oxidation applications has tended to disappear. This reaction is promoted by a high pH, accelerating the reaction kinetics, hence the need to control the pH (> 7.0) and to allow for a sufficient contact time (5-10 minutes). In the case of waters having low mineralised content, and containing high levels of dissolved organic matter and a requirement for a very low coagulation pH (5.5 to 6), preference should be given to locating the KMnO4 injection point to between the settling tank and the filter after adjusting the pH to a favorable level (7.0 to 7.5). Potassium permanganate is also occasionally used for the partial oxidation of some OM, to remove unpleasant tastes or to combat the development of algae within the clarification equipment. Using KMnO4 for pre-oxidation requires that the amount injected is meticulously controlled; as any excess dosage can impart a pink coloration to the treated water, caused by the presence of soluble Mn(VII). prepares the water for subsequent biological treatment. However, there is a fairly strict optimumdosage (approximately 1 mg · L–1) and contact time (approximately 1 minute); beyond these levels, the floc will "redisperse". with polluted water, a main oxidation step is appropriate (producing residual O3) as part of the subsequent treatment in order to ensure complete oxidation of any compounds formed during the pre-ozonation stage. The interest of pre-ozonation will be illustrated later on with examples of treatment using coagulation through a filter (see end of clarification) or a complete clarification + polishing treatment (see section polishing: removal of organic matter and micro-pollutants).